Grab sample: 15.45 grams per tonne (g/t) gold, 159 g/t silver Ag and 114.5 g/t tellurium. The 2018 trenching program focused on the COD North worksite in the Gold Drop Southwest Zone. The program tested gold soil anomalies which were identified by the Company in 2017. The COD North worksite is located northeast of the COD vein worksite. 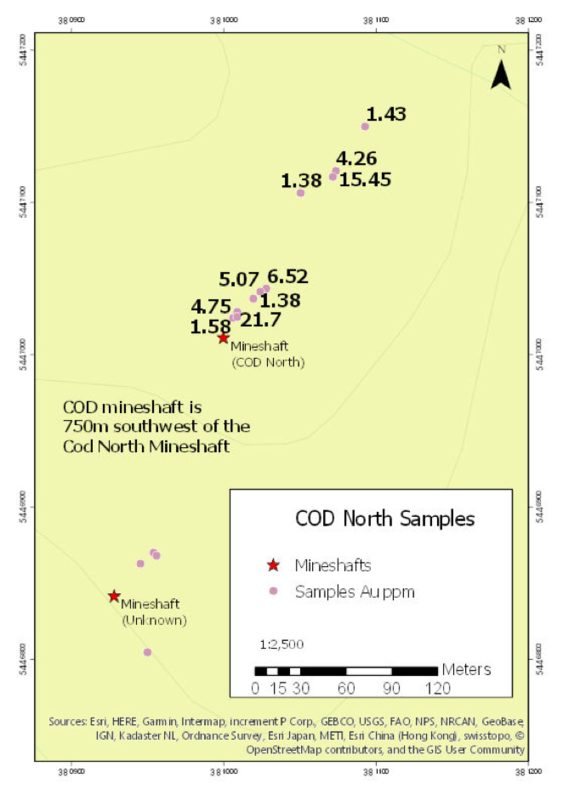 The 2018 trenching program exposed several showings of the COD North quartz vein(s). Thick overburden and bedrock faulting made for a difficult program. 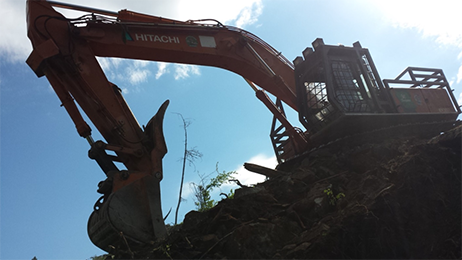 A total of 16 rock samples were collected and submitted to ALS Canada in North Vancouver for analysis. 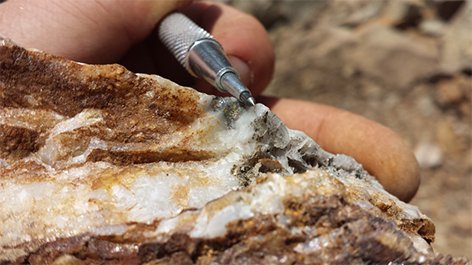 Ten of the samples exceeded 1/g/t gold while also returning significant silver and tellurium analyses. The best results came from the northern trenches near the COD North mineshaft. The highlights include grab sample 112753 of rusty quartz vein that assayed 15.45 grams per tonne (g/t) gold, 159 g/t silver Ag and 114.5 g/t tellurium; and sample 112759, a chip sample across a 40 centimeter wide northeast-southwest striking sub-vertical quartz vein, that assayed 21.7 g/t gold, 216 g/t silver and 149 g/t tellurium. The following table lists COD North rock samples exceeding 1 g/t gold. 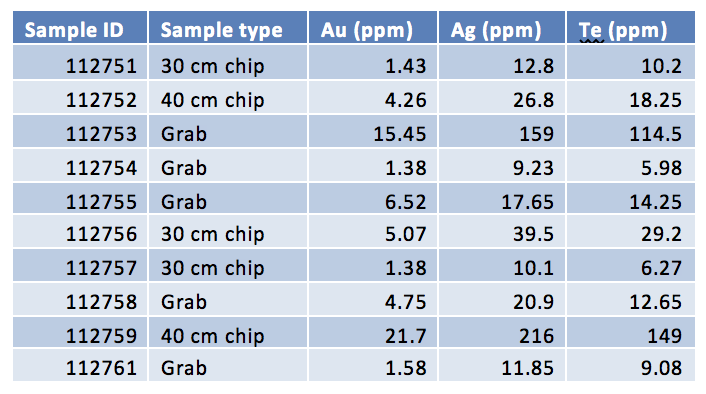 The 2018 COD North rock samples were analyzed for gold by Fire Assay – AA and for 48 Elements by Four Acid ICP-MS. 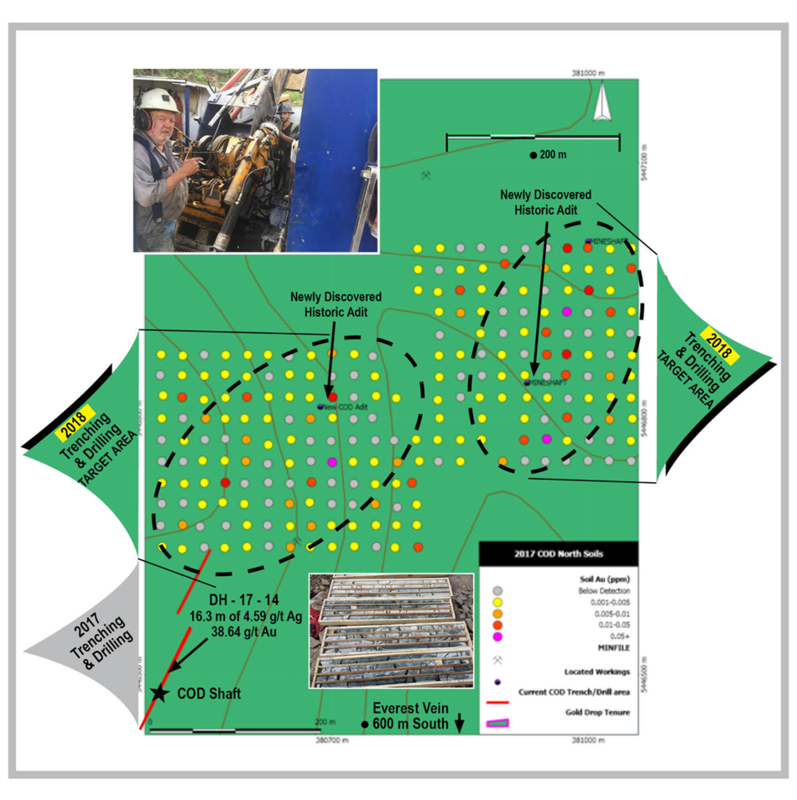 Samples exceeding 100 g/t silver were re-analyzed for silver by Four Acid ICP-AES.